So I heard you've got a boo-boo. Yeah I broke my collarbone and knocked myself out pretty good at Squaw Valley. 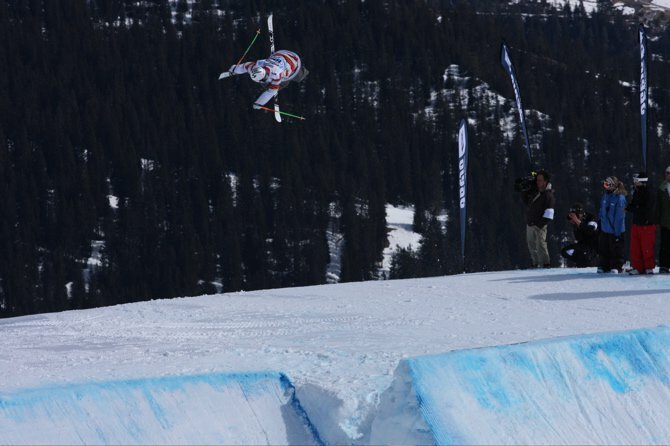 We were doing some shooting there for a Skullcandy and Level 1 type of thing and we were hitting a jump line that they had built for us. It had been windy for a couple of days though so we had been kind of waiting around to hit the big 90-foot stepdown which was the main feature we wanted to try. Then on the last day the wind mellowed out a bit so we got a chance to hit it, so I guinead it and landed about 30 feet down the landing which was fine because it was a super long landing to the point where you could probably have gone 120 or 130 feet and been comfortable. I had just put on my helmet before I hit it and then the wind picked up again so we decided to ski down to see if we got any shots while we waited for the wind to mellow out. And then on the way down I was just spinning around from switch to regular going maybe two miles an hour, or so I'm told because I don't really remember anything, and caught an edge whacked the ground real hard right onto my head and scored myself a fat concussion and broke my collarbone pretty good. So how's that going to affect your plans for the summer and over the next little while? Well it shouldn't really affect my summer but it definitely put an end to my season which is a bummer because there were still a lot of things I wanted to do, like shooting with Level 1 at Copper and there were a couple other pretty unique features I'd been scoping, but I'm unfortunately not going to get the chance to do any of that because winter is coming to a close. But I'm not too worried about it because it's the best time it could have happened and I'm going to be a-okay and primed and ready to go in time for the first session of Windells this summer. Are you coaching at Windells this summer? Yeah I'll be up there all summer and will probably be coaching on and off, like take a session off here and there so I can just shred around and do some more filming because I think Berman is going to come up for a bit and shoot. How was your winter other than the early end so-to-speak? You know what, it was great. I had a lot of fun. I started real early and as terrible as it is to get injured and have it end early I had a super long and fun year. I traveled a bunch and went to a lot of places I'd never been before. 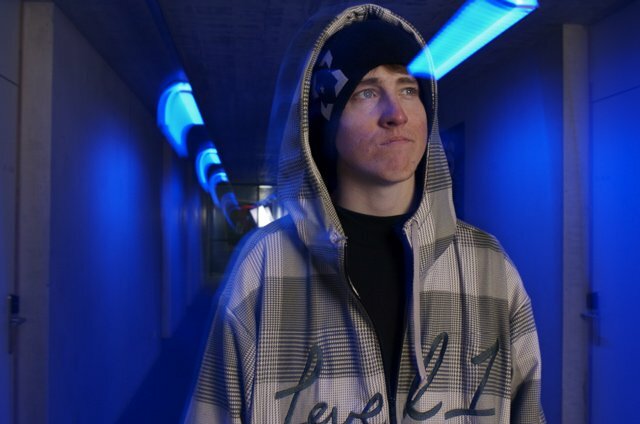 I made it over the ocean to hit up Europe again and went to Switzerland for the first time, I went to the US Open for my first time as weird as that seems, and I did pretty much all the major competitions and got to travel a bunch for filming as well. So I really had a lot of fun in a lot of different places. Who'd you film with this year? Level 1, Field Productions and 4bi9 Media. I pretty much did a good bit with everyone and I think I'll have a full segment with all three of those production companies. How are things going with Amplid? It's going great. I'm really stoked on the skis and the company and the people that are involved with the company. It's a smaller company and not a big name, big budget type of thing and all that kind of jazz, but it's really nice to be able to know all the people that own and operate the company and be able to have a lot of input and say in regards to what's happening and what's going to be happening with skis and production and the way the company is marketed and such. It's a really tight knit group and I'm really stoked on everything that's happening with me as it relates to them and I plan on staying with them so I can do my part to help build their name in the US. So you're arguably one of, if not the most well loved skier on NS right now. How's that make you feel to have that many kids so pumped on you? It's amazing. I'm super stoked on how many kids out there like what I'm doing and like my skiing and I can't thank all of them enough because it's such encouragement to continue to do what I'm doing and continue to do the skiing I like to do with the style I like to do. It's the ultimate motivator and it makes me feel that what I'm doing is meaningful in some way and that's a great feeling. Speaking of NS, care to weigh on the recent controversy surrounding the Jiberish video where more than a few kids accused you, Adam Delorme, Mike Hornbeck and Jon Brogan&nbsp;of trying too hard to afterbang? (laughs) Yeah I'll delve into that. You know the whole point of that video while it was being made at Breck was that we were going out there to make an edit that was going to have some steeze that might be controversial, you know with a lot of afterbang and whatnot. So my opinion on all of that is that it's just all about having fun. We were having a great time out there and those days were a couple of the most fun park days I've had all season. Just out there with my friends, doing some filming with no pressure and just good times in the park, trying to make it as steezy as possible and do some absurd things. I really like controlled landings with no movement so that it shows you know where you are coming out of your trick. And whatever you want to call it, whether it's afterbang or ride-away it's just all about personal style, and as long as you're doing something different or something that you think looks smooth and you enjoy doing, the more power to you. Yeah I wouldn't let it bug you too much though. The season is over now and everyone's pissed off they're not skiing anymore so they're cranky and therefore the hate is always pretty strong this time of year on the site. Yeah, I could see that, especially for all the East coast kids, which is exactly where I used to be. You know they see a video from a place like Breck where people are still skiing a sick park this time of year and it's hard not to get a bit jealous and angry. And I know how it is because I used to hate that when I lived on the East coast, skiing three or four months of the year and then going on Newschoolers, because you really just can't get away from it and you're on it all the time, and getting frustrated seeing videos of people still being able to ski and have a great time when your season is already over. That's hard, believe me I know. So speaking of the East, how about giving everyone a little head's up on your background. Well I'm originally from Pittsburgh, Pennsylvania, and growing up I skied a pretty good bit of the East coast, mainly around PA and Maryland. The resort I grew up on is called Wisp and I would ski there two days a week, weekend warrior style, all through elementary school, middle school and high school and then I traveled a bit here and there through the East coast in Vermont and skied around there a bunch. 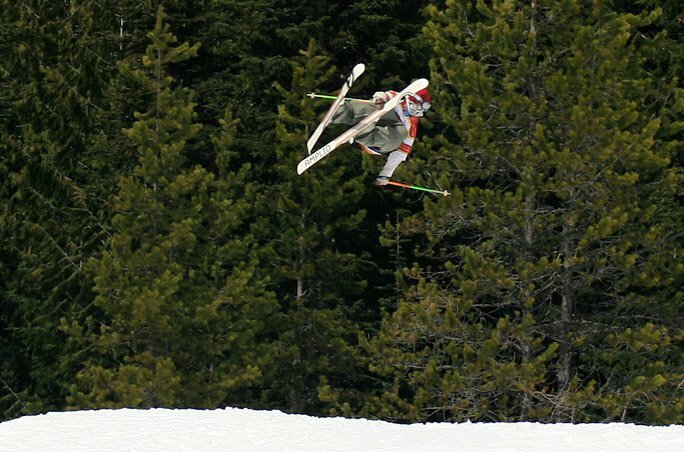 But I pretty much didn't really learn how to ski legitimately until I moved out to Utah at the start of the 06-07 season. So how'd you get so damn good so damn fast? (laughs) You know I don't know. 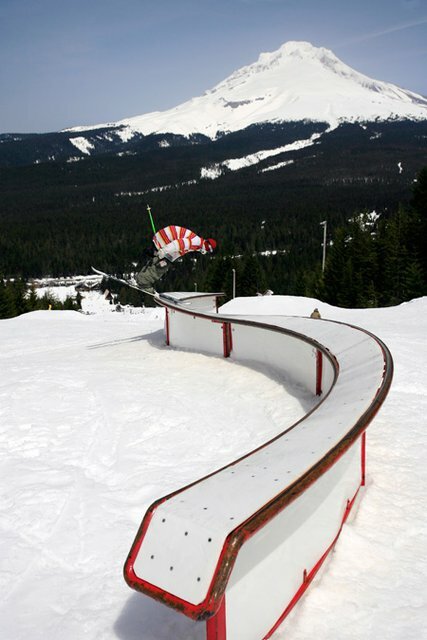 I'd always been pretty decent at rails because I skied a lot of rails in the East, just lapping the park doing rails, rails, rails, boxes, boxes, boxes. And then when I moved out to Utah I was doing two days of school a week so I had five days a week to ski, so I pretty much just lapped Park City non-stop nine to four, five days a week and slowly and surely got more and more comfortable and was just having so much fun skiing all the time that I started encouraging myself to try new things, and I really made a point of trying to learn something new every day I went skiing and that's really what makes skiing fun for me. Learning something new or improving on something you know or experimenting with something new. I have this ADD when it comes down to skiing because I always have to be skiing or doing something or working on something. So I guess I'd say just skiing as much as I possibly could is how I progressed as quickly as I did. A lot of your fanfare has come from the fact that you are doing a lot of new and different and unique tricks that other people aren't doing. Is being innovative and trying new things what drives you? Yeah I'd say so. 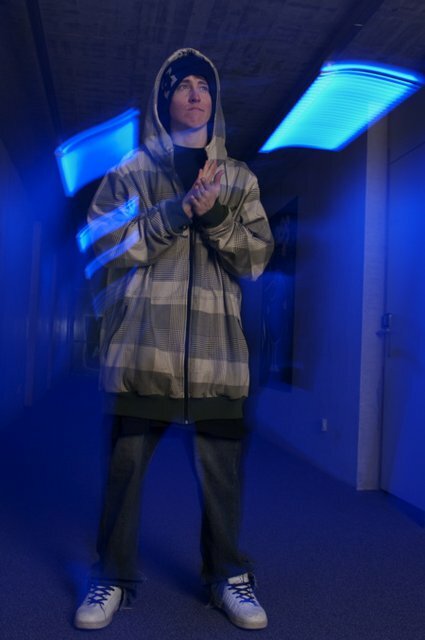 I love to try new things and I'm always trying to think of new ways to do tricks or grabs or combos or a new type of style. I try to take a little bit from everything I see in other people's skiing that I like and then make it my own. 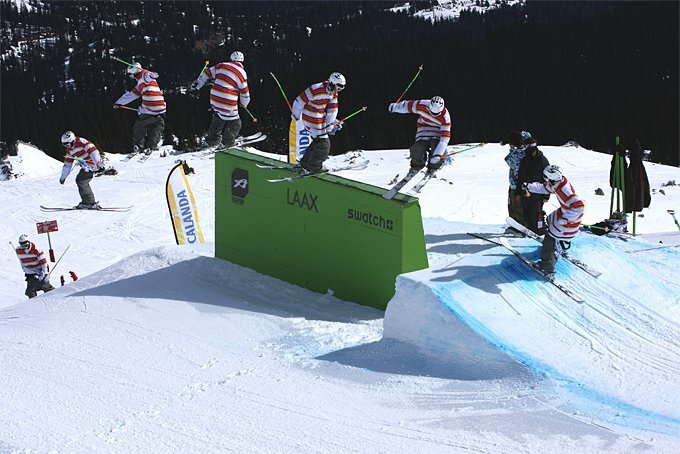 I'm a big fan of a lot of different skiers and watching them really encourages me to learn new and unique things. There's a lot of people. Pretty much all the kids I ride with out in Utah are always doing things that I like, and on the mainstream side of things I really like a lot of the stuff Henrik is doing now a days. He's young and he's killing it and we always have a great time skiing together. 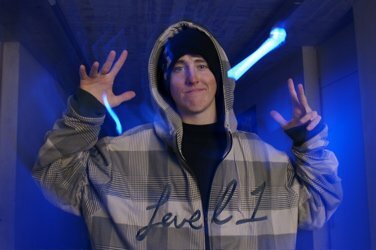 Also Mickael, although he doesn't ski that much anymore, and all of the Level 1 guys, like Vanular, Rainville, Hornbeck and the Sean's. I really, really like a lot of the tricks they're doing and I love watching them ski. Is there anyone out there who you haven't skied with yet that you'd like to? That's a tough question, because in the last year I've been fortunate enough to ski with most of the people I really looked up to over the years. I guess Mickael though. I'd really like to ski with Mickael. 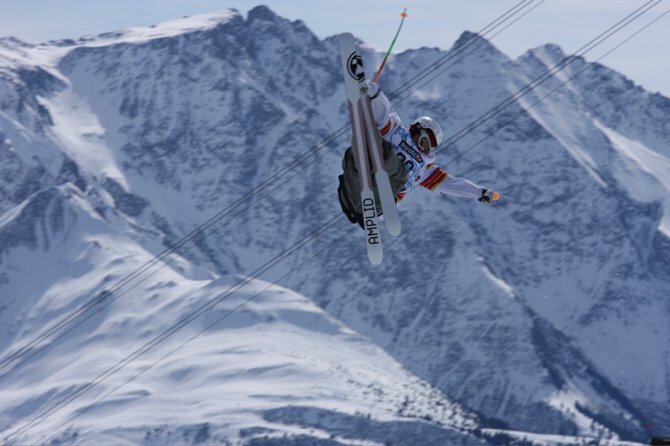 He was injured at European Open in Switzerland so he didn't get to compete or anything which was a bummer because I'd really love the opportunity to just ski around with him, because he's pretty much a steeze Jedi master from the old days (laughs). I heard a rumor from the Martini brothers that you hate powder skiing and that I should ask you about that. (laughs) Oh man. It's not that I don't like it. I love going out and skiing fresh pow days with my friends and I have a lot of fun doing it, but there's just something about backcountry and hiking and earning your turns that just doesn't work for me right now. I'm kind of waiting a little later in my career to start focusing on that when I'm older and my body is a little more beat up, because to be straight-up, I'm just having so much fun skiing in the park now a days with my friends learning new things and I still feel like I have a lot to do in the park and on rails and I just want to focus on that while I'm young. So I wouldn't say I hate it, although that's the joke amongst me and a bunch of my friends (laughs) but I guess it's just not quick enough for me, because like I was saying, I have mad ADD and I like to always be moving and doing things as opposed to waiting around. I mean I still do it and there's going to be some backcountry jumps in my segments this year, but for now I'd rather have good all around segments with urban, park and bc...and let backcountry become my primary focus later on. So I'm definitely going to come back to it in a few years and focus on it more, and I look forward to doing that because I have so much respect for people who have full backcountry segments and all the time and hard work that they put into it. So I don't mean to sound like I'm hating on it, because I fully understand the fact that it takes a lot of commitment and time and working and waiting to put together a good backcountry segment, but because I'm just too anxious and ancy and I have to ski too much I just don't feel I'm dedicated enough at this point in my life and career to put together a good backcountry segment. Fair enough. So in skiing and the industry as a whole, what would you say you're most stoked on right now? I'd say the fact that the sport has been growing and it's still growing and the industry has started to become more receptive to that. It's getting bigger, people are starting to make more money, there's better distribution, there's more movie companies, there's new ski companies every year and there's more competitions. Every year it seems like there's a new competition that's so much better than the ones before it, like this year with North American Open, which Jon and Simon did a great job on. So I'd say I'm most stoked on the growth that is so apparent in the industry, because as much as it's nice that our sport is small and that everyone knows everyone and that it's easy to be in the middle of it, I think it's nice to have the sport grow and have their be a little more money involved and bring it to the mainstream a little bit more. Nice. So on the other side of the coin what would you say you're least stoked on? The fact that I can't ski halfpipe as good as everybody else (laughs). There's so much money in halfpipe right now and I'd love for some of that to move over to the slope discipline, because it's making me feel like I should stop skiing slope and park and train halfpipe like a madman (laughs), because it looks like a lot of fun and there's a lot more competitions and a lot more money. 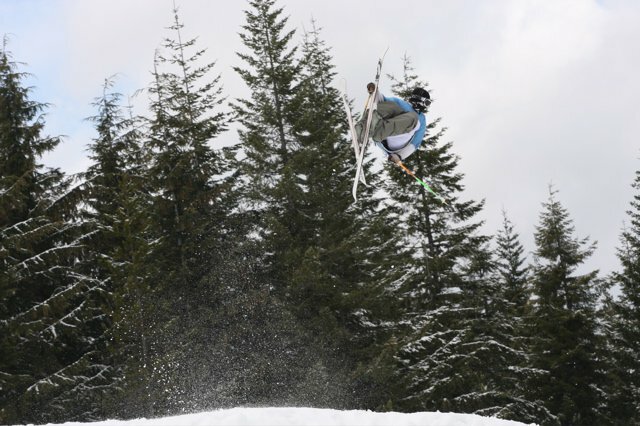 How important is the money factor to you as an up-and-coming skier? Because a lot of athletes seem totally content just being able to ski and get some free gear and maybe travel a little bit while others are much more focused on the financial side of things. Which of those is more important to you? Well the most important thing to me is being able to ski as much as possible for as long as possible and make it as big a part of my life as I can. But as much as I'd love to say that I ski for the love of it and really I do, to continue skiing for years and years in the capacity that I was able to this year I'm starting to realize that it's important for me to focus a little more on the financial side of it just to sustain this habit, this addiction I have to skiing. So I'd say the financial side of it is pretty important to me right now, not really because I want to make a huge living off of it or just ski for money but more so I can have money to continue skiing, making segments, going to competitions and do what I love. Alright, now for the last question, and you're probably not going to like this, because it's another tough one. Me and the boys were sitting around the office yesterday and while I was typing out questions for you, JD Caron, one of our tech guys, asked me to ask you if you could only watch one video segment for the rest of your life, what would it be? Ohhh my God! I don't know! (laughs) That's an impossible question. (laughs) That's exactly what I figured you'd say. Ohhh man, there's so many ways to go with this. I mean there's Pep in 1242, Mickael in Exact Science, Tanner in Teddybear Crisis, Liam in Long Story Short, Vanular in Shanghai Six. Oh man, I don't know, I can't decide. Can I phone a friend like on Who Wants To Be A Millionaire? (laughs). I guess I kind of want to say Mickael in Exact Science. No wait don't put that down yet! (laughs) I kind of don't want to say anything because I just can't pick one. (laughs) Fair enough. Thanks for the interview Tom.